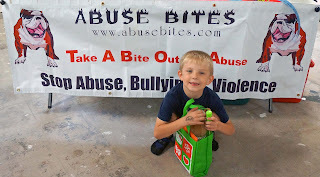 Abuse Bites blog is a free blog with abuse articles and anti-bullying tips. If you’re wondering how to blog or how to start a blog, check ours out, it’s really simple to learn. Blogging is fun, educational, and real. By using text, pictures and videos you can blog about anything. 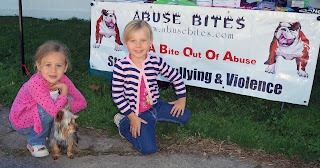 We blog to stop bullying, abuse, and violence. A blog should have a purpose, you have to decide what that purpose is and be consistent. You can blog once a week, several times a week or once a month. It's all up to you! When we stay silent, more innocent victims suffer. 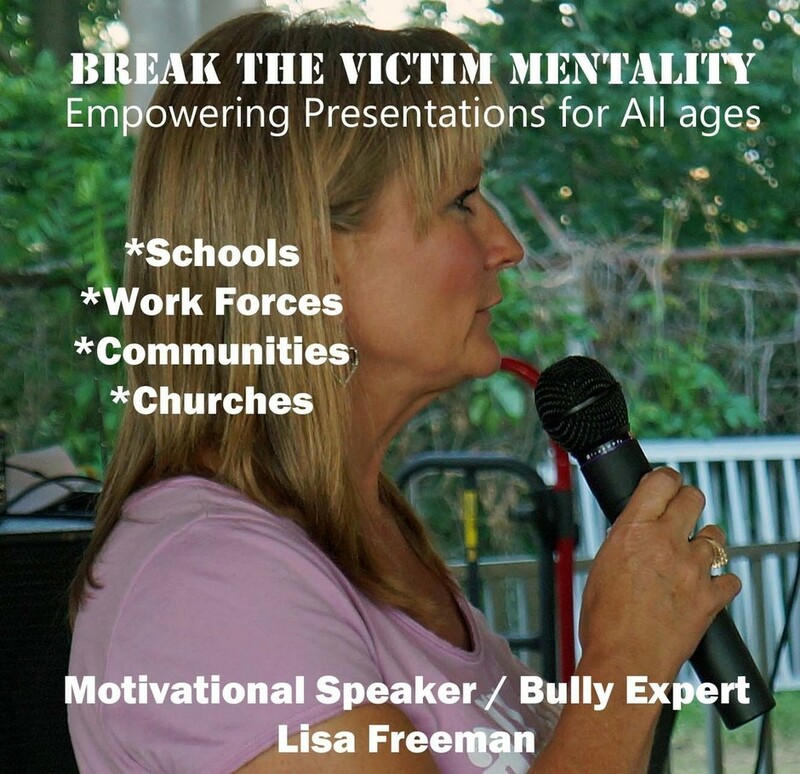 "I will not be silenced," Motivational Speaker and Michigan Bully Expert, Lisa Freeman says. "We have to raise our voices or more people will be victimized, murdered, or commit suicide. We are killing our own. This is insane. "We live in the USA. Have we forgotten our freedom, our amendments, our constitution? America was founded on equality. And diversity is what has made America thrive. Yet today, families are barely surviving. "I tell everyone to look through the eyes of a child. Kids do not realize any differences until someone points them out. If a child hears someone say this child or person is ugly, then they begin to see what others may define as ugly in that person. This is done with weight, race, those with disabilities, with gender, and a variety of other differences. "My heart sank when I received a letter this week from a concerned mother whose 8th grade son is being bullied in school by a teacher and principal because of his weight. The thing is, this same boy was bullied in 7th grade by these same two professionals and pulled out of public schools and home schooled. However, the teen lost over 60 pounds, so he wanted to return to school. Sadly, the same bullying occurred. Now mom has been forced to pull him out of school yet again. Even sadder the superintendent will not return her calls, the local media refuses to share her story, two attorneys have turned her down, and she feels horribly victimized herself. "Bullying would not go this far, if we addressed it for what it is. "Bullying is a community problem. The biggest problem today is that the bullies are often being protected and allowed to keep bullying others, while in fact the victims are made to pay and suffer in silence. This should not be happening. Shame on us. We are putting Matt's safe school law to shame as well. Come on wake up! "Our program works with schools, teachers, principals, parents, and students to bring a solution to every victim/target, every bystander, and every bully. The solution is not slapping a bully's hand or trying to put a band-aid on bullying; the solution is bringing equality to every human being in every community while embracing diversity. 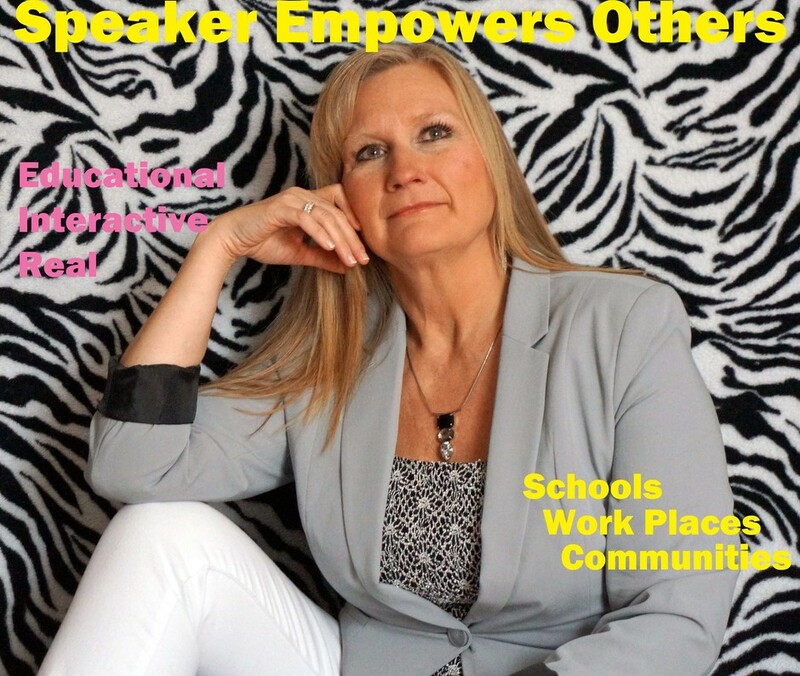 Lisa Freeman is an educational motivational speaker from Owosso, Michigan who is passionate about youth and family. She specializes in abuse, bullying, and recovery. 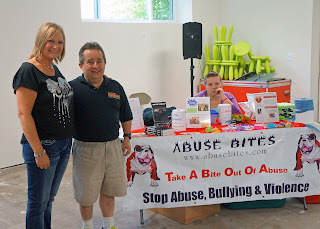 She is the founder and president of Abuse Bites and the Healing Projects Specialist for the Bully Police USA. 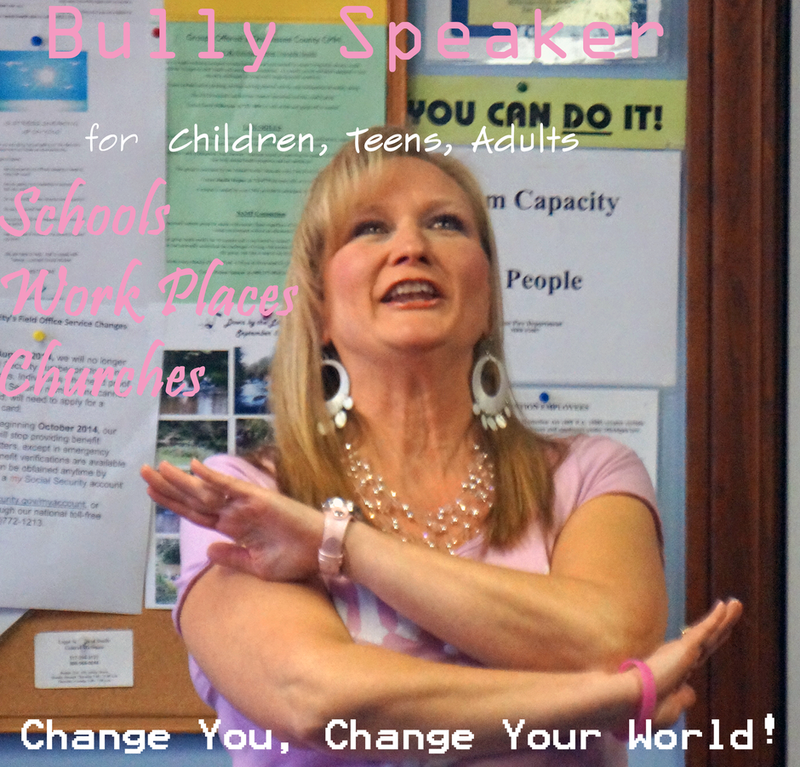 She offers interactive anti-bullying assemblies in schools, anti-bullying workshops in the work place, anti-bullying conferences in communities, and anti-bullying seminars in churches. Contact her today to help with your next event. A whopping 77% of students today in the USA admit that they have been or are a victim of bullying. That is more than 3/4 of our young people! 8 YRS AGO: 1 out of 10 students who were bullied. TODAY those stats have grown by more than 50%. 1 out of 4 students have reported being bullied and this is just in school. What about at home? In the community? At church? Although there are not statistics on this type of bullying, we see the effects of this in our every day life: marriages break up, families move away, and often even feel pressured into leaving their church due to bullying and victimization. Yes, sadly bullying happens everywhere--even in the workforce. 1/3 of adults who are employed admit they are victims of bullying. 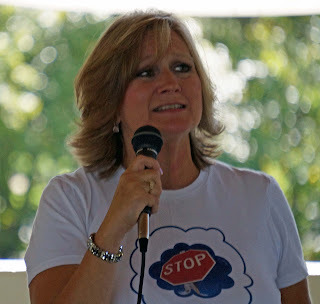 Lisa Freeman is a Motivational Youth Speaker from Owosso, Michigan. 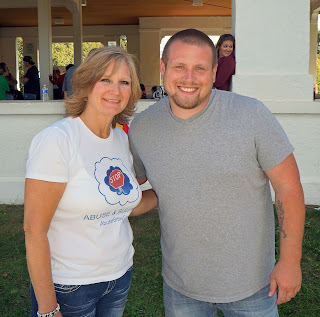 She empowers students through educational school assemblies where she involves students in games, scenarios, and demonstrations to give them practical ways to defeat bullying, break their victim mentalities, help bullies, challenge bystanders, and motivate all to strive for unity and become productive survivors! 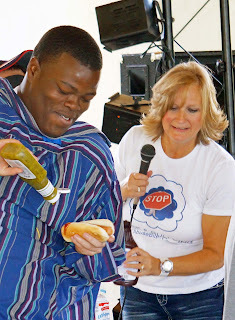 Jeremiah (above) was nearly a victim of bullycide. He was bullied, harrassed, teased and threatened in high school. Now he sings to help others. Chances are if you answered this question it could be the person cyber bullying you on facebook, via text, or maybe a person bullying you at work, school, or in your neighborhood. You might even have a bigger brother or sister who bullies you from time to time. Maybe you’re abused by a close friend or relative. Growing up my bully changed from person to person. I was even the bully myself for a time. 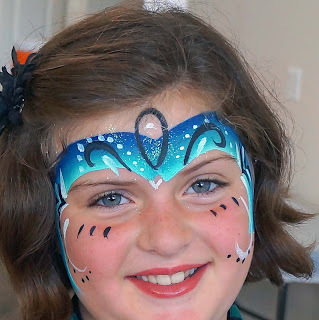 My children have had their share of bullies too, and some of them have even bullied others. 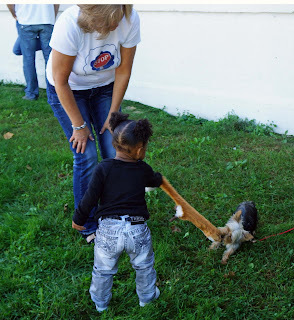 We even had a bully dog. And quite often still I work with both bullies and bully dogs. Most people wanna know… why bullies bully? How to prevent a bully from bullying? 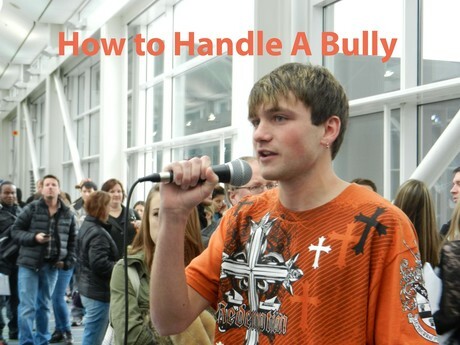 Where to get help for bullies? To answer all these questions I believe we must first understand a bully. By getting inside their head and seeing how they think, we can get inside their heart to change the way they behave. I’ve been hurt, abused, bullied and let down, and no one helped me, so it must be okay to hurt others. I have to do it to get friends, protect myself so no one bullies me. Sometimes I’m jealous of what others have. Sometimes I like to pick on someone to make my friends laugh. Sometimes I just want what someone else has. I do it for the power it gives me. *Bottom line: we offer help for victims, bystander, and bullies. We bring EMPOWERMENT and CHANGE to every school assembly and community workshop. 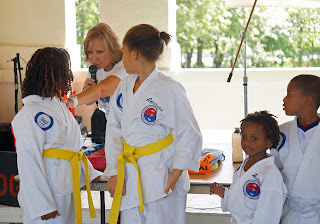 We offer activities for kids and play fun indoor games with teens to teach them empathy, acceptance, and the importance of diversity, to show them how to stop bullying, abuse, and violence. Please let us help you and your youth. 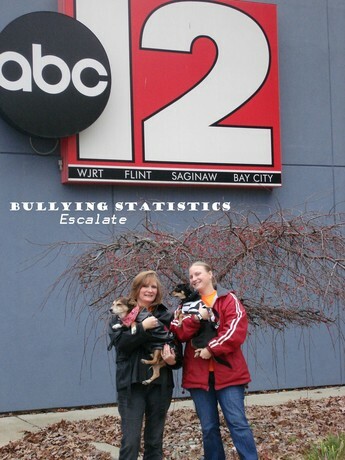 We Stop bullying in schools and communities in Michigan and throughout the USA. Is Bullying Still A Problem? Is Your Child At Risk? Since Matt's Law, the new anti-bullying law passed in Michigan, it seems as though bullying and bully prevention actually got swept under the rug! What a slam in the Epling's face! They have worked so hard for years to bring this about! Parents and students from all over Michigan have come to me on a regular basis, reporting horrendous bullying in their schools and asking what to do. Of course I'm not big on the law or legislation, but I am big on compassion and love as both a parent of kids who were bullied and being a victim myself. I was a bully too, I'm not going to lie. But today I'm healed, and offer that same hope and healing to others. 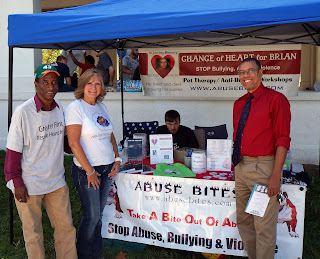 By coming to your community, church or school and doing our fun, educational, interactive workshops for kids, teens and adults; victims, bystanders and even bullies can be set free! Bullying can stop--at least at the level we see it today! Bullying is just a behavior. Most of the bullies just need to feel empathy and to have someone connect with their side of the bullying spectrum. We can do that. Most of the complaints from parents and students that I received over the past year started with simple bullying, but then because there were no programs in place for prevention and safety methods, the bullying continued and escalated. Students lives were threatened. They became suicidal. Teen suicide is huge. It almost happened to us! It could happen to you! Let us help you! Under Matt's Law your school is required to have an anti-bullying program in place and to have special speakers on bullying come in to educate their staff and students. We'd love to come. Give us the name of your school, your principle, as well as their address, email, and phone number and we'll do all the work! What is your school doing to protect your children from bullying and bullies? We'd love to hear both sides of the spectrum -- good and bad. Maybe your child is a bully and you don't know what to do. We'd love to hear from you too and get you and them the help that is needed. School Violence is Huge, But together we can Stop Bullying, Abuse, and Violence! Bullies, the Joke is On You! I love to joke around and laugh more than anyone. But I realize now, that what I may view as funny, may be the brunt of someone else's pain. It took me some time to see that many of my jokes were hurtful insults to others. If we look at comedians today like Larry the Cable Guy, Eddie Murphy, George Lopez, and many others, their stand up shows all have one thing in common--they're belittling or bullying someone to make others laugh. Don't get me wrong, these are some of my favorites. BUT while their jokes can be hysterically funny, not everyone is amused... no, rather abused. Pranks are funny too. I've played pranks and practical jokes on nearly everyone I've known. Most of them pranks were harmless. But a prank that happened recently in West Branch Michigan to a high school student, Whitney Kropp, wasn't so innocent. No, her pranksters set out to embarrass, humiliate and chastise her in front of her whole school. They nominated her for homecoming court as a practical joke. A teenage prank. Seemed innocent enough. They'd all get a good laugh. Whitney learned of the prank and was horrifically humiliated and even wanted to end her precious life. Her pranksters probably thought they had the upper hand. What a joke! BUT thankfully, her school, her city, and her entire community came together to support her and she defeated her bullies and won! She didn't retaliate, she simply stood up for herself, and she wore her crown proudly that night! Now the whole world is supporting her! My hearts cry is that every school, city, and community would stand together like this against all forms of bullying and set the innocent victims free. 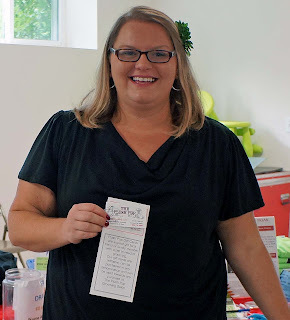 Whitney Kropp is a SURVIVOR! Fake Friends: Are Your Children In Danger? What would you do for your friends? Lie? Steal? Cover up for them? Take the blame? Murder? All any of us want in life is to be loved and accepted by someone. We don't always know when 'fake friends' are taking advantage of us or using us. So, many times, we'll do whatever it takes just to be included. I know I did. I let my so-called friends talk me into everything; skipping school, smoking, drinking, drugs, stealing, running away, sleeping around, etc. That's crazy! I didn't want to do any of it, but because my 'friend' wanted me to, I did. Last night I watched "The Bling Ring," about these teen wannabe's in Hollywood who used a new kid with a panic disorder to help them break into all the celebrities homes and steal their goods. At the end, when everyone was arrested, the boy that was lured into the whole thing said, "I didn't do it for the money. I did it because I had friends. I've never had friends. And I liked how I felt when I was with them--I was a different person." Now they are all facing prison time! Recently I spoke to two different mothers who have special needs boys, who just turned adults. Both boys share pretty much the same story. They had been lured by a young teen girl saying she was 18, and that she liked them, wanted to go with them, and wanted them to do sexual things with her and her friends. Of course, these boys, given their mentality (functioning at only a 10 year old's age level) jumped at the chance to have a real relationship with someone. The girls videotaped the event and have not only made these boys a laughingstock in the community, but now they are facing prison time as well! Even movies portray that you have to be a certain person or look a certain way to get the hot chicks! Beauty is in the eye of the beholder. Too bad the movies have it all wrong. True love is not found in a person's looks or position they hold, or the abilities they have, NO it's found much deeper--in the heart! I raised four children with varying disabilities. Between them they had dyslexia, learning disabilities, Asperger's Syndrome, emotional impairments, bi-polar, panic, schizophrenia, heart condition, ADD, ADHD, not to mention OCD and ODD. None of them had many real friends growing up. Many times they were lured into giving their money and prized possessions away. Even as adults, now, people still try to use them, but I've educated them to be on the look out about such friends. Today people with disabilities are increasingly becoming victims of what is called "Mate Crime" where fake friends take advantage of, hurt, and sometimes even murder them. These fake friends show up when these individuals get their disability checks and finagle them out of their funds. Some have even moved into their homes and lived off them! Read about both men, the victim and the murderer. This story and others only prove that we must work even harder to educate our disabled children, our community, and those who could and should protect them! 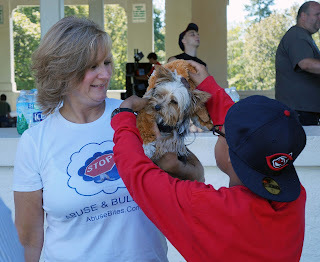 Together we can stop abuse, change hearts, and save lives! 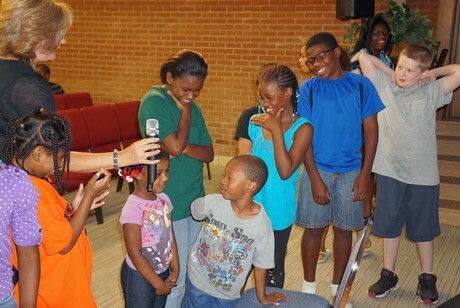 We held an Anti-Bullying Rally in Flint yesterday! Rocking the Violence Out Of Flint was amazing! Ryan LoRee from Team Revelation Gym put the event together. 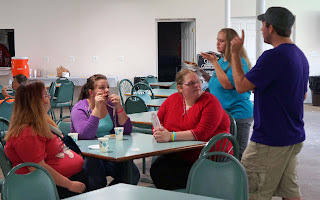 He had talked to some people out at Walmart when we were doing our fundraising event there and that's when he got in touch with us about speaking and doing our Abuse Bites presentation. Anything to team up with others to stop abuse, bullying and violence! Ryan (above) founded Team Revelation a non-profit judo/wrestling type place to give free instructions and mentoring to troubled kids and youth! Kudos Ryan! Ryan's two beautiful little girls fell in love our Yorkie, Lover. This little boy stopped to play with Lover. But then I actually got her to play with Lover! Great Things Happened All Day! And we met some really amazing people! The Judge William Crawford (right) and a Respite Volunteer from a local shelter. 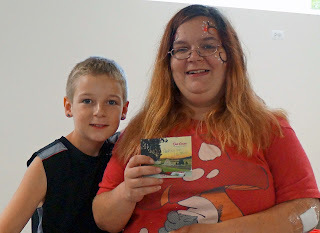 A lady & her daughter are entering our Free Book Drawing! We donated a whole box of books so that everyone who entered could win! 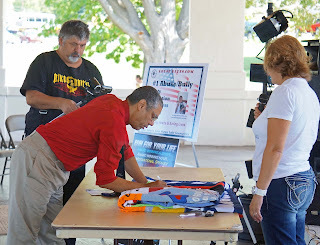 Judge Crawford stayed longer than he intended just to do the special honor of signing Brian's Memory Quilt! It was a very emotional moment! The man behind the judge is making a documentary about this event. We played some fun interactive games! These Kids Learned How to FIGHT BACK to Stop Bullying! 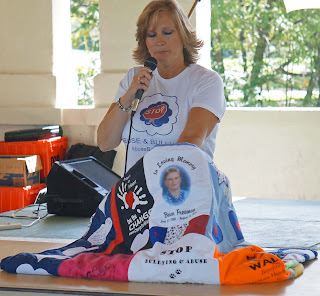 Then I had the privilege of sharing "The Change Of Heart Program" in memory of my precious son, Brian. And I could not believe the results! People were coming up to me, one by one, telling me what a difference my speech made in their lives. WOW! This young man came up after and confessed he had been a bully until the 8th grade, but had since asked forgiveness from his victims. He also explained that he often spent the night at his cousins house when he was younger and they would bully him and his brother, so he thought he had to fight like them to be cool. I gave him a hug and thanked him for sharing. Another young man had a shirt on that said "I love Haters" and he was so loving, but said to me, "I shouldn't have worn this shirt probably to something like this." I said, "I love your shirt, and I love Haters too! With people like you and I they will learn to be Lovers!" And he gave me a hug! He works with the Reach program to help troubled youth. A woman came up and thanked me. She said her husband wasn't going to attend the event at all, but at the last minute changed his mind. Later he told her, "I think I was meant to here this lady speak, it really touched my heart." This man had been bullied and abused his entire life! 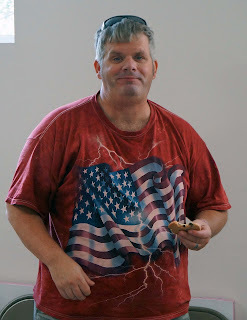 Several others thanked me as well and were really happy about what we're doing. But the grand finale and best part is when Jeremiah sang, "We Are The Body" by Casing Crowns. It's the first time in quite awhile he's sang in front of a crowd. Just to think, a month ago he nearly committed suicide, but God spared him and is using him once again to change hearts and save lives! This is one proud mamma, excited about taking this message forth! Thanks Ryan Loree, Team Revelation, and The Bridge Church for allowing us this great opportunity to present at your 1st Rocking the Violence Out of Flint Benefit! May we do even more awesome things together next year! Fighting abuse, bullying and violence can be a very long, lonely road at times. Many times the advocate can still take the brunt of bullying to try to push through prejudice barriers and strongholds. This hasn't been an easy battle for me, but it has been rewarding to see the CHANGED HEARTS & SAVED LIVES! 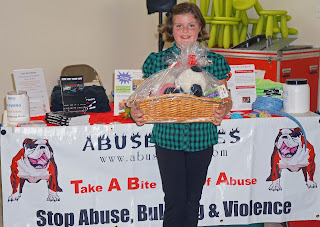 Yesterday, we celebrated the Abuse Bites 3rd Annual CHANGE Benefit! Although not a lot of people came out, due to another awesome event in town being planned for the same day and time, it was a success! 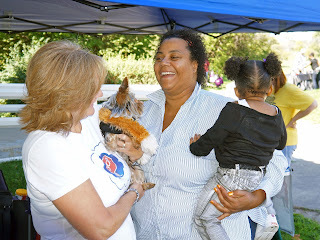 Success can be measured in a variety of ways, not just how many people came to our event or how much money was raised. I was a 7th grade middle school drop out, abused runaway, who was kidnapped, beaten, raped, forced into human trafficking, and nearly killed many times. Later I suffered through two horrifically abusive marriages (one physical, the other sexual and psychological). BUT, after all that, at the age of 26 God healed me, delivered me, restored me, and called me to be a warrior. That's the day I STARTED FIGHTING THIS WAR ON ABUSE, BULLYING AND VIOLENCE. I've overcome many obstacles in my path such as post traumatic stress syndrome, panic and agoraphobia. Then I went onto college, graduated with a degree in Christian Ministry, became an award winning author, certified pet therapist and dog trainer, founded two non-profits, raised over $20,000 for needy and abused people and pets, And I'm not finished yet! Although these have been great successes, the biggest success is knowing that when we go into the schools and communities to do our CHANGE workshops, that more than 85% of the students and even adults stand and come forth, deciding to make a change in their own lives, and knowing they can be the CHANGE for others! Abuse, Bullying and Violence is all about making a CHANGE in our own lives, to impact others. Won't you stand with us today and be that CHANGE? Now a word of thanks to all the angels who helped bring this about! 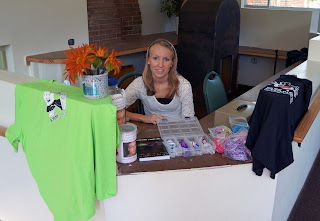 Special thanks goes out to our Volunteers like Ashley Thornton (below), who is so passionate to help, that even though she had a sprained ankle, she showed up and gave it her all! Thanks Ashley! We love and appreciate you! Special Thanks to Thomas Dignan! A great man of our community, Thomas Dignan, even found time in his busy schedule to come out and support us. Why? 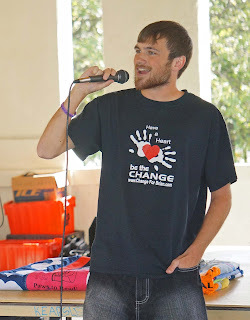 Because he's passionate about changing hearts and saving lives and stopping bullying! Thank you Thom! You've got my vote! 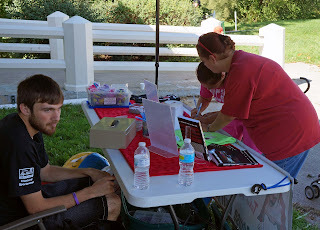 Adults and kids alike received awesome prices thanks to our awesome sponsors. Everyone loved the Prime Time Pizza & Bread! and we thank GiGi's for the Drinks! 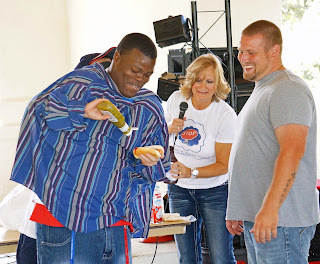 And kudos to the other great sponsors like Big John Steak & Onion, Maurices, Treasures, Jumbo's, Gilbert's True Value, Janelle's Family Restaurant, Mancinos, Crave Bakery, Wendy's, Burger King, Capitol Bowl, and Crave! and to the Glo Kids Team for the Carnival & Face Painting! 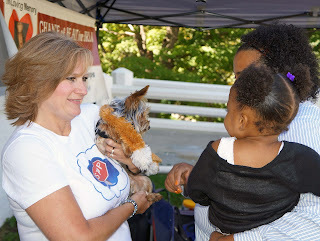 Together we are all CHANGING hearts and saving lives!